Even your dogs or specially your dogs are allowed to enter your mysterious kingdom. Let them know it. 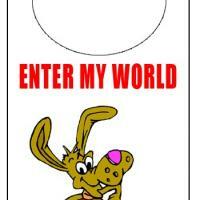 Print and hang this dog door knob hanger on your door.